When Dragon took his family to Washington, DC so that he could speak with President Bush about the Gods, he enjoyed a picnic in a park. 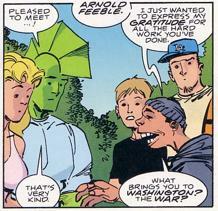 Arnold Feeble was one of many people that approached the hero to thank him for all of his efforts. Sadly for Arnold, he was stepped on by a rampaging monster as it battled against Dragon and other heroes.